by Sreyan Chatterjee, Gausia Shaikh and Bhargavi Zaveri. The legal framework for insolvency resolution in India underwent a structural change when the Insolvency and Bankruptcy Code, 2016 (IBC) was passed in May 2016. Once the provisions relating to corporate insolvency were notified (November 2016), the first cases of insolvency started being admitted in the National Company Law Tribunal (NCLT), the quasi-judicial tribunal vested with adjudication powers under the IBC. The final orders on these cases became the first public records of India's new insolvency framework. In a recent working paper titled Watching India's insolvency reforms: a new dataset of insolvency cases, we introduce a new dataset of all final orders passed by the NCLT and the appellate forum, the National Company Law Appellate Tribunal (NCLAT) under the IBC. In the paper, we also illustratively apply the data to answer questions about the economic impact of the IBC and the functioning of the judiciary under it. This blogpost presents some summary statistics on the IBC and our preliminary findings relating to the working of the IBC. We use information collected from the final orders published by the NCLT in the first six months of operationalisation of the IBC, that is, from 1st December, 2016 until 15th May, 2017 (hereafter, "sample period"). There are 23 fields of information for each case in the data-set. This includes parameters such as, who are the initial users of the insolvency process under the IBC, what kind of evidence are they using to support their claims before the NCLT, the average time taken by the NCLT to dispose off cases, the outcome of the proceedings, reason for dimissal of a case and the variation in admission and dismissal across the nine benches of the NCLT. Does the law improve the balance between rights of the creditors and the firm debtor during insolvency? The Indian legal regime preceding the IBC conferred weak rights on creditors, especially unsecured creditors. It created scope for the judiciary to intervene in the commerical matters of debt re-structuring. The law itself and the courts and tribunals enforcing it, also exhibited a rehabilitation and pro-debtor bias (Ravi 2015). While the sample period represents the earliest days of operationalisation of the IBC and the current data-set is small to conclusively answer this question, this early data indicates that there has been a shift in the enforcement of creditors' rights under the IBC. Table 1 shows who used the IBC during the first six months of its operationalisation. Table 1: Who used the IBC? Of the 110 cases that were disposed off during the sample period, 75 percent of the cases were triggered by creditors. Of these, 75 percent were filed by unsecured operational creditors. This indicates that operational creditors, who hitherto had weak enforcement rights, have taken recourse to the IBC to enforce their claims. There may be multiple reasons for the relatively low number of financial creditors taking recourse to the IBC during the first six months. Anecdotal evidence suggests that firm debtors default to financial creditors the last. Financial creditors may largely be secured creditors who may choose to enforce their claim by realising their security. There was lack of regulatory certainty on provisioning norms for banks and the apprehension of scrutiny by the anti-corruption investigative agencies among bank management. However, in the absence of data on default or the enforcement of security by financial creditors in India, the reason for the divergence in creditor behavior in triggering the IBC is unclear. Another feature of interest is the behaviour of the debtor. There is a commonly voiced apprehension that the debtor will avoid resorting to insolvency because the IBC moves away from the debtor-in-possession model to a framework where the debtor's board is suspended and the affairs of the debtor are run by an independent insolvency professional. However, contrary to this apprehension, around 24 percent of the petitions in this early six month period have been filed by debtors. Of the 110 cases that were filed, 50% of them have been admitted by the NCLT and are now undergoing a mutually negotiated debt restructuring process. This shows that unlike the previous regime where the judicial bodies exhibited a pro-debtor bias, there is no explicit admission or dismissal bias for insolvency cases under the IBC. Within the caveat that these are early days and we still have to observe how these cases get resolved, the observed data suggests that creditors are able to use the new insolvency and bankruptcy regime with increasing confidence compared to the previous regime. Does the law empower various types of creditors when the firm defaults? Table 2 shows the kind of operational creditors who took resort to the IBC during the sample period. While majority of the operational creditors are suppliers to the debtor, we find that even holders of decrees are taking recourse to the IBC. Table 3 shows the outcomes of the insolvency cases filed by different kinds of creditors during the sample period. While 43 percent of the cases filed by the financial creditors were dismissed, the percentage of dismissal for operational creditors is slightly higher at 58 percent. A reading of Tables 2 and 3 would indicate that even during the earliest days of its operationalisation, a wide variety of creditors have shown the ability to trigger insolvency proceedings under the IBC. This is in contrast to the previous regime where only a certain subset of creditors were able to trigger insolvency proceedings against firm debtors, and other creditors had to file cases in civil courts. Does the law empower only large sized debt holders? Table 4 shows the size of debt claims that have been used to trigger the IBC during the sample period. The table also presents the distribution across the different quartiles, by showing threshold values at three different cut-off points: for the 25th percentile point, the 50th percentile and the 75th percentile point. The 25th percentile point is the value below which 25 percent of the cases will fall, the 50th percentile point is the point below which 50 percent of the cases will fall and so on. Further, this has been done by the different types of stakeholders: financial creditors, operational creditors and the debtor. million (or Rs.856.5 crores) which was only 8 times larger. This shows that operational creditors, who had considerably weaker rights under the previous regime, had considerably large debt repayments due from firm debtors. Thus, while the IBC is being triggered by creditors on a wide range of size of defaults, most of the cases observed so far (more than 75 percent of the cases) tend to be triggered using debt defaults that are approximately 10 to 100 times larger than the threshold of Rs.100,000 set in the law. We find that the published data is ambiguous about behavioural or structural changes in the judiciary to fit within the role defined for it, in the IBC. The information display systems of the NCLT do not give an overview of the entire cycle of a case, and bits and pieces of information are available in the final orders. For instance, while each order specifies the date on which it was passed, several orders do not capture other information critical for assessing the time taken for the disposal of insolvency petitions, such as: the date on which the insolvency petition was filed, the date on which it first came up for hearing. 16 of the 110 orders studied did not reflect the amount of debt or default that was the subject matter of the case. Admittedly, there are more laborous methods to discern the entire life cycle and facts of a given case, such as examining the case records maintained by the registry at the each bench of the NCLT. However, for reasons explained in our paper, we find that these methods will also not help in ascertaining the performance of the NCLT as a whole. This constrains the ability of both the court administration as well as independent researchers to readily assess the performance of the NCLT. With the limited data that is available from the published orders, we have attempted to answer two important questions about the functioning of the NCLT under the IBC. Does the NCLT function within the timelines set in the law? The IBC requires the NCLT to dispose off an insolvency petition within 14 calendar days from the date on which it is filed before it. Our dataset captures the following dates in the life-cycle of an insolvency petition: date on which the case is filed (T0), date on which it first comes up for hearing (T1) and the date on which it is disposed off (T2). The amount of time that elapses between T0 and T1 could be attributed to the internal processes of the NCLT in scheduling hearings for a case. Our assessment shows that the NCLT exceeds the timeline of 14 days prescribed by statute. Table 5 summarises our findings. Table 5 shows that the average time taken from the date of filing the insolvency petition to the date on which it first comes up for hearing, is 18 days. The average time between the date on which it first came up for hearing and the date on which it is finally disposed off, is 16 days. Finally, the average time taken for disposal is 24 days (T0 to T2). This is significantly more than the timeline of 14 days prescribed under the IBC. Currently, the data does not allow us to analyse the reasons for this delay. Is the role played by the NCLT as visualised within the IBC? While the law enumerates specific grounds for dismissing an insolvency case and is largely biased towards allowing an insolvency to be triggered if the debtor has committed a default in repayment of an undisputed debt, the NCLT has dismissed petitions on extraneous considerations as well. Table 6 shows the various grounds on which insolvency petitions were dismissed during the sample period. A review of a sample of dismissals classified as "Others" in Table 6 shows that the NCLT considers factors not explicitly spelt out in the IBC for dismissing the insolvency petition. For instance, in an insolvency petition filed before the Mumbai bench, the Tribunal recognized that all the ingredients required under the IBC were present to admit the petition. However, the NCLT extended the scope of its inquiry to the balance sheet of the debtor and held that since the debtor had sufficient assets on its balance sheet, it would be unfair and inconvenient for the debtor if the petition were admitted. The NCLT ignored the creditor's argument that the provisions of the IBC do not allow the Tribunal to embark upon a balance sheet analysis. This indicates that the NCLT seems to be viewing the admission of an insolvency case as an excessively harsh outcome for a debtor. If this trend continues, it may degenerate into a debtor-favouring bias going ahead. Thus, the data shows that the working of the NCLT is not always in line with the letter and spirit of the IBC. We find that there is no standardised format of recording case information. Consequently, several final orders lack in basic information such as the kind of creditor who filed the petition, the claim amount and the date on which the insolvency case was instituted. Our finding on information gaps in the orders of the NCLT is in line with the findings of other research done with respect to the orders passed by the Debt Recovery Tribunals in India (Regy and Roy 2017). There are three adverse consequences of such information gaps in the NCLT orders. First, the absence of basic information about the case hinders the ability of the NCLT to monitor the efficiency of its own benches. It also constrains researchers from assessing the quality of the procedural requirements and outcomes of the law. Second, this will hinder the ability to identify systemic lapses in the functioning of tribunals and in designing appropriate interventions. Third, inadequate or incomplete data has implications for the overall accountability and transparency of these tribunals to the public, and in the long run, will erode the credibility of the NCLT as an institution. The empirical analysis in our paper, though preliminary, indicates that the IBC is likely to have a structural change in the behaviour of economic agents, as well as in the areas where the NCLT functions as the adjudicator under the IBC. Our exercise of building a dynamic dataset that is geared towards impact assessment, also brings out the gaps in data that courts publish. Our findings on the data gaps, elaborated in greater detail in the paper, will provide a framework for re-thinking the data management and publication systems of tribunals in India. The ultimate goal of this dataset is to provide a foundation to answer questions on the impact of the IBC and the overall functioning of the Indian bankruptcy regime. The dataset is dynamic and will be updated on a regular basis. As the insolvency cases increase, the dataset will too increase in scope and size. As more data gets published, relevant fields, such as recovery rates and expenses associated with the recovery process, can potentially be integrated into the dataset. This will fuel deeper research on insolvency and credit markets in India. Such data-backed research will support policy interventions in this space in the years to come. The Indian insolvency regime in practice -- an analysis of insolvency and debt recovery proceedings, Aparna Ravi. Economic & Political Weekly, Volume 1, No. 51, December 2015. Understanding Judicial Delays in Debt Tribunals, Shubho Roy and Prasanth Regy. NIPFP Working Paper 195, May 2017. We thank Susan Thomas for useful discussions and insights on empirics. The authors are researchers at the Indira Gandhi Institute of Development Research. Flat buyers under IBC: Creditors or consumers? The Indian bankruptcy regime is developing very fast. There is a risk that the law may soon diverge from the original policy intent. One such example is the recent regulation by IBBI creating a third category of creditors - other than financial or operational creditor. Commentators have suggested that flat buyers would fall under this third category. This comes in the backdrop of recent decisions of NCLT and NCLAT that have left flat buyers jittery about their future once the real estate company enters corporate insolvency resolution process (CIRP). prompted IBBI to create a third category of creditors. This third creditor can neither trigger the CIRP, nor be on the Committee of Creditors (CoC). Second, BLRC had categorically stated that not all assets present within the insolvent company shall form part of the liquidation. Whether the corresponding provisions of IBC will protect flat buyers of insolvent real estate companies remains to be seen. There are multiple ways in which creditors could be classified: financial versus operational, secured versus unsecured etc. The BLRC had to decide how to classify creditors in different contexts. One such context was CIRP - who will trigger it? Who will be on the CoC? Faced with these questions, the BLRC report noted that both the debtor and the creditors should have the power to trigger CIRP. However, a creditor could trigger the CIRP only on clear evidence of default. Since the process of establishing default would have to be different for financial and operational creditors, the BLRC had to classify creditors into these two categories. In this policy scheme, no third category of creditors was envisaged. The Committee deliberated on who should be on the creditors committee, given the power of the creditors committee to ultimately keep the entity as a going concern or liquidate it. The Committee reasoned that members of the creditors committee have to be creditors both with the capability to assess viability, as well as to be willing to modify terms of existing liabilities in negotiations. Typically, operational creditors are neither able to decide on matters regarding the insolvency of the entity, nor willing to take the risk of postponing payments for better future prospects for the entity. The Committee concluded that, for the process to be rapid and efficient, the Code will provide that the creditors committee should be restricted to only the financial creditors. In spite of the clear policy rationale for having only two types of creditors (financial and operational) for the CIRP process, the ambiguous language of IBC has now caused confusion. First, most Indian statutes have only one section for definitions. In contrast, IBC has three sections with the title "Definitions" - section 3, 5 and 79. While section 3 is for the entire Code, section 5 is only for Part II (corporate insolvency) and section 79 is only for Part III (personal insolvency). The word "creditor" is defined in section 3(10) to include "any person to whom a debt is owed and includes a financial creditor, an operational creditor, a secured creditor, an unsecured creditor and a decreeholder". This inclusive definition suggests that under IBC there could be creditors other than "financial creditor" and "operational creditor". This doubt is further entrenched because various sections within Part II (corporate insolvency) use "creditor" as well as "financial creditor" and "operational creditor". This drafting gives the impression that the legislature has used the word "creditor" to include more than just financial and operational creditor in CIRP. Second, Indian statutes usually use a negative definition while making binary classifications. For instance, under FEMA there are only two kinds of transactions: "capital account transaction" and "current account transactions". To achieve this, the law provides a principle-based definition of "capital account transaction". Then it defines "current account transactions" simply as "a transaction other than a capital account transaction". Similarly, IBC could have also defined "financial debt" and then defined "operational debt" as any debt other than "financial debt". That would have ensured that there is no third category of debts (and creditors). Unfortunately, IBC provides principle-based definition for both "financial debt" and "operational debt", thus creating scope for a third category of debts. These legislative ambiguities seem to have prompted IBBI to create a third category of creditors, contrary to the orginal policy intent. Some commentators have opined that certain flat buyers would fall under this third category of creditors. Simultaneously, IBBI has categorically denied media reports suggesting that flat buyers will now be part of CoC. On the other hand, NCLT has ruled that flat buyers are not "operational creditors" either. In view of these differing view points, it would be useful to first understand the basics of a simple flat purchase transaction. Most buyers pay the real estate developer in advance for delivery of the property at a future date. The problem begins when the developer defaults in delivering the property on time. Buyers resort to various legal actions either to get possession of the property or to get their money back. Clearly, in these cases the buyers are not creditors of the real estate company. They are merely consumers of its services. Just like a pre-paid mobile customer is a consumer of the telco. In one exceptional case - Nikhil Mehta v. AMR Infrastructure - NCLAT held the concerned flat buyers to be "financial creditors". But this was because of an exceptional clause in their agreement. The developer had contractually agreed to pay a monthly amount to the buyers till the property was delivered to them. In view of this unique clause, NCLAT held that these flat buyers were "financial creditors" of the developer company. This is not a principle of general applicability. Therefore, it can be concluded that all flat buyers are consumers but not necessarily financial creditors. If flat buyers are consumers of the real estate company, what happens to them if a bank triggers CIRP against the real estate company? This is an important question with practical implications. Although the BLRC did not discuss this issue specifically, it had explicitly recommended that "not all assets that are present within the entity, from the start of the IRP, can be considered for liquidation." Accordingly, section 36 of the IBC excludes "assets held in trust for any third party" from being included in the liquidation estate. It could be legitimately argued that the funds and properties held by the insolvent real estate company in trust for the third party consumers (flat buyers) should get the protection under section 36. In that case, these funds and properties cannot be taken away by the creditors (like banks) of the real estate company. However, section 18 of the IBC suggests that the interim resolution professional cannot take control and custody of these assets. In view of this contradiction, it needs to be seen how the jurisprudence on "assets held in trust" develops to provide effective remedy to aggrieved flat buyers under IBC. When IBC was enacted, policymakers realised that unforeseen challenges are likely to crop up during its implementation. That is why section 242 of IBC empowers the Central Government to remove difficulties faced during implementation. However, if necessary, the government can always streamline the law by suitably amending it. In view of the above complications arising out of the insolvencies in the real estate sector, policymakers need to consider if IBC is currently equipped to handle the challenges ahead or would an amendment be necessary to equip it suitably. Pratik Datta is a researcher. Should we recapitalise the banks? by Ajay Shah in Business Standard, August 20, 2017. Three young chess players who could be the next world beaters by Devangshu Datta in Business Standard, August 19, 2017. Has resistance to economic reforms waned in India? by Tadit Kundu in Mint, August 17, 2017. The costly failure of the South Asian judiciary in Mint, August 17, 2017. Silly responses to financial internationalisation: Bank Negara hits out at SGX and ICE in The Star, August 10, 2017. Part 1: NPA crisis: The rise and fall of Bhushan Steel into the great Indian debt trap, August 8, 2017. Part 2: NPA crisis: Why banks keep lending big bucks, try to hide the distress signals, August 9, 2017. Part 3: NPA crisis: Banking on a new law for answers, August 10, 2017. An unsettling precedent under IBC by Gausia Shaikh & Bhargavi Zaveri in Business Standard, August 8, 2017. New technology accelerates the rise of English in India: Duolingo looks to learn more Indian languages by Shashwati Shankar in The Economic Times, August 7, 2017. Government may give Bhim App users cashback bonanza on Independence Day by Digbijay Mishra in The Economic Times, August 7, 2017. Also see: Subsidies are the last refuge of a failed policy maker, April 16, 2016. Discrimination, norms, family issues or safety? Why Indian women are quitting jobs by Namita Bhandare in The Hindustan Times, August 5, 2017. EH Carr's sense of history by Tim Black in Spiked, July 2017.
by Vrinda Bhandari and Renuka Sane and Bhargavi Zaveri. The public discourse on Aadhaar has largely focused on concerns about the privacy issues associated with the collection of personal information, and the constitutionality of the Aadhaar (Targeted Delivery of Financial and Other Subsidies, Benefits and Services) Act, 2016 ("the Act"). Regardless of the outcome of the case at the Supreme Court, most residents will likely have to interact with the UIDAI, which is the body empowered to roll out an enrollment and authentication program for beneficiaries of welfare programs. The UIDAI is an Agent established by the Principal (Parliament), with three powers. The law allows the State to compel an individual seeking a state-sponsored subsidy to undergo the enrollment and authentication processes designed by the UIDAI (although Aadhaar has now been made mandatory for certain non-welfare schemes as well, which goes beyond the conception in the law). The UIDAI is empowered to license and regulate Registrars and enrolling agencies to collect the demographic and biometric information of individuals, and enroll them under the Act. Finally, the UIDAI has quasi-judicial powers, such as the power to suspend the licenses of such enrolling agencies and Registrars. Since the 1980s, governments have established specialised organisations which perform certain functions. These Agents have diverse mandates such as regulating a specific sector (SEBI and TRAI); administration of social welfare schemes (the erstwhile Benefits Agency in the UK); and running prisons (such as the HM Prison Service (HMPS) in the UK or the Dienst Justitiële Inrichtingen - National Agency for Correctional Institutions (DJI) in the Netherlands). Unfettered discretion: When agencies have the power to write subordinate legislation (i.e. regulations), this power is often not accompanied by checks and balances. In liberal democracies, there are elaborate checks and balances that are placed upon Parliamentary law. These checks and balances can, and often are, diluted in the context of the "regulatory state". For example, in all these years of SEBI's establishment, only one of its quasi-legislative instruments has been challenged. Compare and contrast this to the constitutional challenge that virtually every significant parliamentary law faces in India. Similarly, in the last 30 years, no order issued by RBI has been challenged by the person penalised. This leads to the possibility of abuse of power (Cochrane, 2015). For FY 2012, a pre-determined strategic goal of the SSA was to deliver "quality disability decisions and services". The SSA's performance report also shows the funds allocated to each objective and a statement of reasons where the performance metric is not met. Requiring an annual report in a prescribed form describing UIDAI's past activities, accounts, and future programmes of work, to be laid before each House of Parliament [Section 27 of the Act]. However, no such manner and form for the publication of the report has been laid down in the Aadhaar Regulations, nor does such a Report seem to be available in the public domain. The conduct of an agency is largely shaped by the law governing it. For instance, Burman and Zaveri (2016) find that there is a correlation between the laws which mandate transparency of a regulator and the responsiveness of such regulators to citizens' preferences. Similarly, the detailed performance reporting by the SSA is underpinned by a law called the Government Performance and Results Act, 1993, a law that set up a performance-oriented framework of reporting for the US federal agencies to show the progress they make towards achieving their goals. In the absence of such statutorily mandated accountability standards, measuring the performance of the UIDAI is difficult. Stories of security breaches and authentication failures for availing benefits abound. For instance, Scroll.in queried the UIDAI about the authentication requests received between September 2010 (when the first Aadhaar number was issued) till October 2016, and how many failed or succeeded. The query was aimed at assessing the efficacy of biometric authentication. The UIDAI replied that it had not maintained any records between September 2010 and September 2012 and that it did not maintain authentication data state-wise. More importantly, the UIDAI revealed that data about the success or failure of the over 331 crore authentication requests was "not readily available", nor was the breakup of the negative reply to the requesting authority on each of the five modes of authentication "readily available". Similarly, cases of fake Aadhaar cards have also been reported. Pertinently, in response to an RTI filed by PTI, seeking details related to all cases of duplicate and fake Aadhaar cards and the action taken on them, the UIDAI refused the request on the grounds that the disclosure might affect national security, or lead to incitement of an offence. The UIDAI also informed PTI that its CIDR facilities, information assets, logistics and infrastructure and dependencies, are all classified as "protected system" under the IT Act, and are thus, exempt from RTI. It further stated that the format in which it held the information contained identity details, which may be prone to identity theft, if divulged. The practical reality thus is that cases of unauthorised leaks/disclosures of identity information are being dealt with on a case to case basis, with zero clarity in the law on who is to be held accountable for such lapses in the future. The report of the Bankruptcy Law Reforms Committee (2015), drew on the regulatory governance framework recommended by the FSLRC and recommended four elements for achieving accountability of the Insolvency and Bankruptcy Board of India, India's new insolvency regulator. While some of these elements were codified in the Insolvency and Bankruptcy Code, others are sought to be implemented in the course of setting up the Insolvency and Bankruptcy Board of India. Recent events at TRAI are pushing the organisation towards sound processes. Cochrane, J. (2015), The rule of law in the Regulatory State. Heidenheimer, A.J., Heclo, H. and Teich Adams, C. (1990), Comparative Public Policy: The Politics of Social Choice in America, Europe, and Japan, (3rd edition) New York: St. Martins. Maggetti, Martino (2010). Legitimacy and Accountability of Independent Regulatory Agencies: A Critical Review, Living Reviews in Democracy Vol 2. Pollitt, Christopher, Colin Tablot, Janice Caufield, and Amanda Smullen (2004), Agencies: how governments do things through semi-autonomous organizations, New York: Palgrave Macmillan. Young Han Chun, Hal G. Rainey (2005), Goal Ambiguity in U.S. Federal Agencies, J. Public Adm. Res. Theory 2005, 15 (1): 1-30. Burman, Anirudh and Zaveri, Bhargavi (2016), Regulatory responsiveness in India: A normative and empirical framework for assessment, IGIDR Working Paper WP-2016-025, October 2016. Vrinda Bhandari is a practicing advocate in Delhi. Renuka Sane is a researcher at the National Institute of Public Finance and Policy, Delhi. Bhargavi Zaveri is a researcher at the IGIDR Finance Research Group, Mumbai. The broad set of Indian listed companies have a high trailing P/E ratio. This suggests that the market believes there will be high earnings growth in the future. Some finance practitioners back out an earnings time series as Nifty market capitalisation divided by Nifty P/E. This `Implied Nifty Earnings' series shows strong growth over long time horizons. In this article, we show that this quick-and-dirty method has an upward bias in the estimation of aggregate earnings growth. 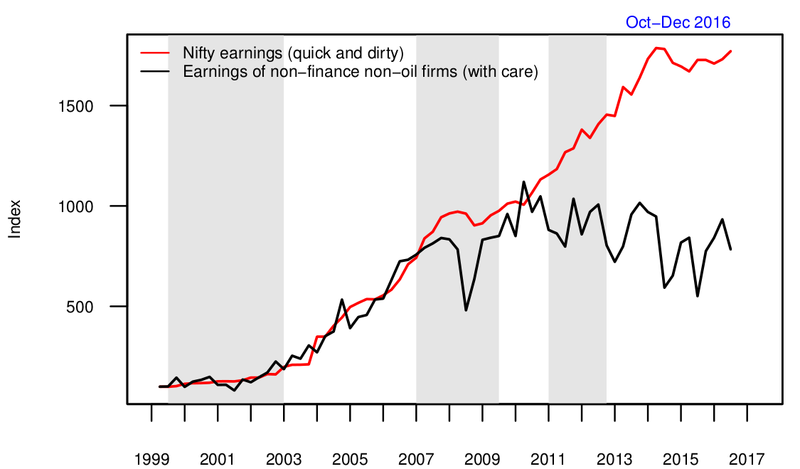 In truth, earnings growth by Indian firms has been stalled for a decade. 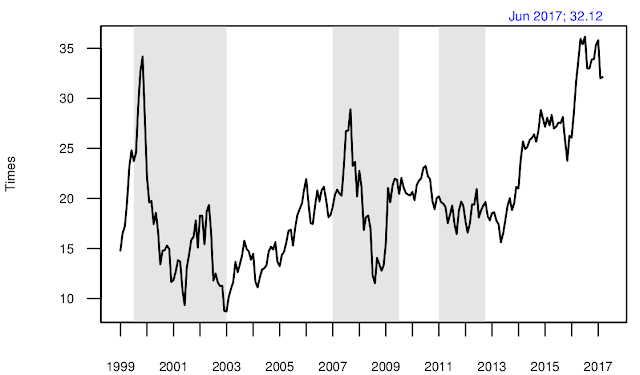 The graph above shows the long time-series of the trailing P/E ratio of the CMIE Cospi index, which measures the broad market valuation. This shows that we are near some of the highest valuations in history. These high P/E ratios would generally suggest that the stock market expects that a period of great earning growth is around the corner. It's important to look back at the recent history of earnings growth in order to evaluate this optimism. As Nifty market capitalisation is measured in rupees, and the P/E ratio is dimensionless, the division yields an earnings value in rupees. This shows pretty good growth in the earnings of the Nifty companies. In the latest few years, the growth is slow, but when compared with a decade ago, the earnings expansion is remarkable. Overall, it's a gain of 18$\times$ in 18 years, which is quite a performance. It is consistent with the common view that India is a high earnings-growth economy. The set of firms that make up Nifty changes through time. From 1996 to 2017, there were 118 firms which have been a member of Nifty atleast once. The Nifty components at time $t_1$ are often different from those prevalent at time $t_2$. Some firms are added and some are removed. We tend to think that these are a few random fluctuations which would tend to cancel out. However, the changes in the set are non-random, and they do not cancel out. The management of Nifty uses a rule set that roughly summarises to this: (a) A pool of eligible firms is formed where the firms have adequate stock market liquidity based on the Impact Cost measure, and (b) If an eligible firm is over 2$\times$ larger (by market capitalisation) than the smallest incumbent, then a set change is effected where the smallest incumbent is removed and the large new liquid firm is brought in. The earnings of the new entrant will generally be higher than the earnings of the smallest incumbent who is removed, as the market value of the new entrant is over 2$\times$ higher. Here is one example, from the April-May-June 2016 quarter. In this quarter, three firms were removed (Vedanta, Cairn India, Punjab National Bank) and three firms were added (Aurobindo Pharma, Bharti Infratel and Eicher Motors) to Nifty. The remaining 47 firms were unchanged. Let's pull together the information about earnings across these changes. The best estimator of earnings growth is that which is made using the identical set of firms observed at two points in time. In the above example, there are 47 firms in Nifty who were present at both points in time. Their aggregate earnings declined from Rs.735B to Rs.635B, a decline of 14%. Three firms were present in Q1 2016 -- Vedanta, Cairn, PNB -- and when their earnings data is used, the aggregate earnings of the 50 firms in Nifty at that point in time works out to Rs.717B. These were replaced by Aurobindo Pharma, Bharti Infratel, Eicher Motors in Q2 2016, and when their earnings data is used, the aggregate earnings of the 50 firms in Nifty at that point in time works out to Rs.657B. The earnings growth obtained by comparing these two inconsistent sets was -8%, which is a more optimistic picture when compared with the decline of 14% for the consistent set. There is a big discrepancy, of 6 percentage points across one quarter, and the direction of the bias in in favour of greater optimism. The wrong method (merely comparing the profits across inconsistent sets across time) does not just introduce random noise, it is biased. It systematically overstates earnings growth of the Nifty set. What actually happened to earnings growth of Indian firms? Oil companies have extreme earnings fluctuations based on fluctuations of global crude oil prices. Their profits do not describe what is going on in India. Finance companies have problems in earnings data, such as the concealment of bad assets by banks. Hence, we look at non-oil non-finance companies only. Aggregation of accounting data for this set of firms is an excellent source of insight into India's business cycle fluctuations. At every two consecutive quarters, we construct a set of listed firms which are observed in both quarters. We sum up the earnings of this set at each of the two quarters. These two summed earnings are comparable across time, as they pertain to the identical set of firms. This yields a nominal percentage growth of aggregate earnings from one quarter to the next. We start an index at 100 and cumulate it up through time using each of these carefully constructed estimates of earnings growth. This tells a story where the average earnings index grew from 126 in 2000 to 996 in 2010, but declined to 783.98 in the Oct-Dec 2016 quarter. Nominal earnings has stagnated in the last decade. 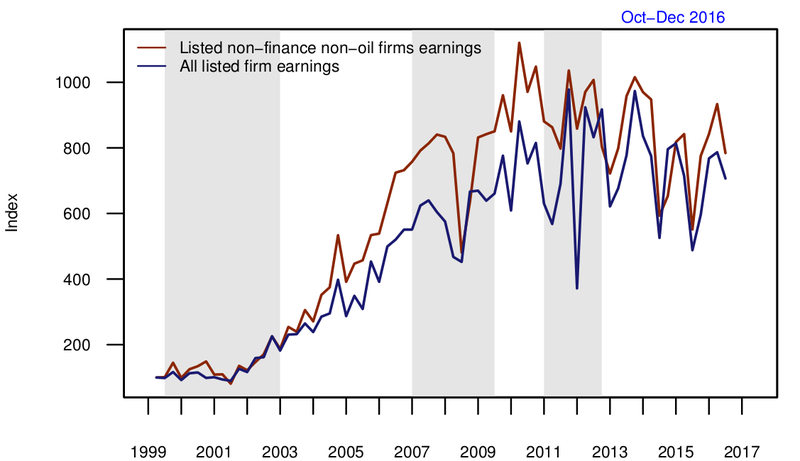 The compound average growth rate of earnings of all listed firms is similar to that of non-finance non-oil firms. Both estimates are roughly 8 percentage points per year below the quick and dirty method. 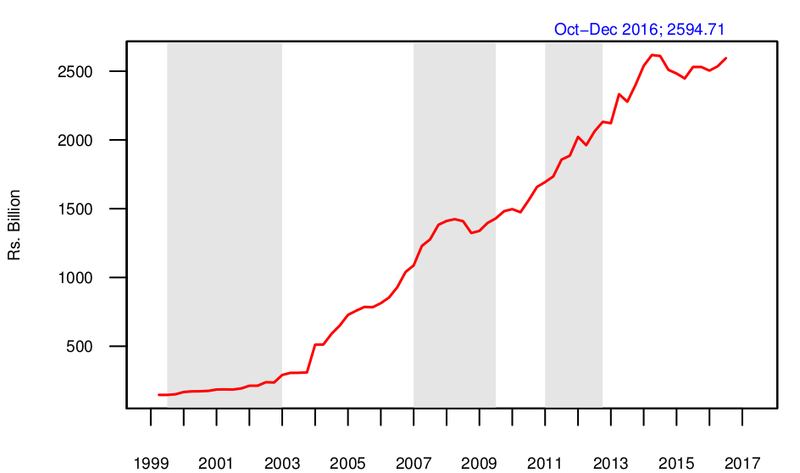 The quick and dirty method suggests 18$\times$ earnings growth in 18 years. 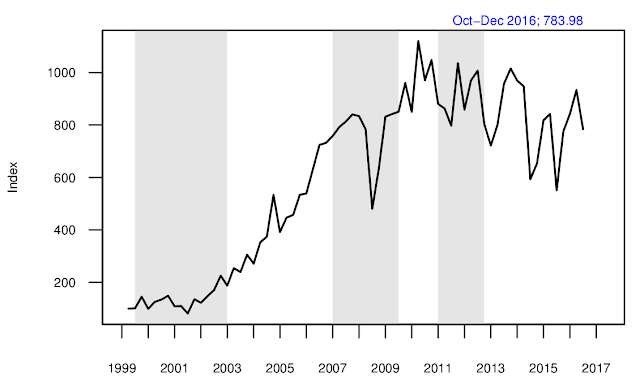 The correct method shows 8$\times$ earnings growth in the same period, and stagnation in the last decade. The stock market believes that a great wave of earnings growth is around the corner, and India is generally considered a market with high earnings growth. However, earnings growth has been elusive for the last decade. More generally, in the past, the Indian stock market has done well on differentiating between firms -- in voting with a high P/E ratio for firms that will do well in the future -- but has fared poorly at macroeconomic thinking. This R program when run using data from CMIE Prowess DX (Mar-2017 vintage) replicates Figure 3 above. I thank Nilesh Shah and Mahesh Vyas for valuable discussions. Pramod Sinha wrote the code and it was audited by Dhananjay Ghei and Shekhar Hari Kumar. Elements of the recovery by Ajay Shah in Business Standard, August 6, 2017. A judgment for the ages by Chinmayi Arun in The Hindu, August 3, 2017. Needed, a financial redressal agency editorial in The Economic Times, August 2, 2017. Also see. India's complicated infrastructure story by Ashwini Mehra in Mint, August 2, 2017. The Past Week Proves That Trump Is Destroying Our Democracy by Yascha Mounk in The New York Times, August 1, 2017. Equity Derivatives versus Cash Equities in India by Jayanth Varma in Prof. Jayanth R. Varmas Financial Markets Blog, July 31, 2017. Also see: Strategic thinking in financial markets policy, July 24, 2017. Artificial Intelligence Is Stuck. Here's How to Move It Forward. by Gary Marcus in The New York Times, July 29, 2017. Also see: Project Tanzanite: Obtaining fundamental progress in the macroeconomics of developing countries, October 24, 2011. Trump is something the nation did not know it needed by George F. Will in The Washington Post, July 28, 2017. Why the Scariest Nuclear Threat May Be Coming from Inside the White House by Michael Lewis in Vanityfair, July 26, 2017. Agrarian crisis: the challenge of a small farmer economy by Sudipto Mundle in Mint, July 21, 2017. Emerging infectious diseases, One Health and India by Shahid Jameel in The Hindu, July 15, 2017. Bitcoins are business as usual in Bengaluru by Aditi Phadnis in Business Standard, July 15, 2017. History of Aadhaar: How Nandan's core team came together by Shankkar Aiyar in Yourstory, July 13, 2017. How Do We Contend With Trump's Defiance of 'Norms'? by Emily Bazelon in The New York Times, July 11, 2017. The Danger of Deconsolidation: The Democratic Disconnect by Roberto Stefan Foa and Yascha Mounk in Journal of democracy, July, 2016. The empty brain by Robert Epstein in Aeon, May 18, 2016. In his recent speech at RBI's Annual Statistics Day Conference, RBI Deputy Governor Viral Acharya called for the creation of a Public Credit Registry (PCR). A PCR is a comprehensive database of all borrowings in the country. The Deputy Governor suggested that submission of information to this registry should be compulsory, and that it should be managed by the RBI. He added that the RBI intended to establish a task force for setting up the PCR. In this article, we argue that there is no market failure that justifies the establishment of a PCR, and that there is no evidence that a PCR is required for an efficient credit market. Given that India has a surfeit of credit information entities, the creation of a new PCR in the RBI is unlikely to help. The public economics approach is that markets work reasonably well in most situations. State intervention should be avoided if possible. Public choice theory suggests that a bureaucracy will try to expand its own budget and functions. A proposal by an agency that tries to enlarge itself should be treated with scepticism. In this light, does India require a PCR run by the RBI? World Bank data shows that most countries around the world do not have PCRs. Countries such as the US, UK, Canada, Australia, New Zealand, Netherlands, Sweden, Norway, Japan, South Korea, all have highly developed credit markets without having PCRs. In these countries, private sector credit bureaus fulfil this function. The international examples the Deputy Governor cited in his speech (Thomson Reuters Dealstreet, and Dun & Bradstreet) are both private entities. The major Consumer Reporting Agencies in the US, as well as the Credit Reference Agencies in the UK, are all private entities functioning in competitive markets. These examples suggest that the credit information industry need not suffer from market failures, as long as appropriate statutory frameworks are in place to deal with issues such as the privacy, safety, and sharing of information. The absence of PCRs in most well-functioning credit markets indicate that PCRs are not required for competitive credit markets. India already has a large number of entities involved in providing credit information. There are four Credit Information Companies (CICs), all regulated by the RBI. It is mandatory for institutional lenders to provide credit information to these companies. The RBI has extensive powers over CICs: even their membership fees and annual fees are decided by the RBI. 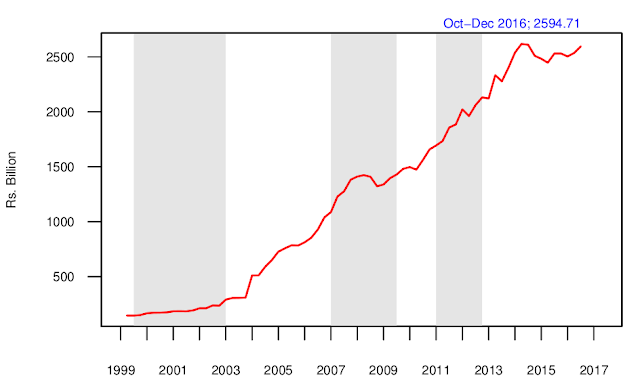 Apart from this, the RBI has previously created the Central Repository of Information on Large Credits (CRILC). The Central Registry of Securitisation, Asset Reconstruction, and Security Interest (CERSAI) was created by the government to record the creation of security interests over property. The MCA21 database of the Ministry of Corporate Affairs is used to record charges on the assets of companies. The Insolvency and Bankruptcy Code (IBC) has introduced yet another type of entity to this space: Information Utilities (IUs). The design of IUs has been thought through by the Bankruptcy Law Reforms Committee and by the Working Group on Information Utilities. The Insolvency and Bankruptcy Board of India (IBBI) has recently issued regulations that enable the registration and operation of IUs, though no IUs have started operations as of yet. To justify a PCR, the RBI needs to explain not just what market failures it seeks to solve, but also why all these other entities were (or, in the case of IUs, will be) ineffective in solving those market failures, and why PCRs will succeed. To make a case for having a PCR in India, the RBI needs to articulate what market failures the PCR will solve. We have seen above that market failures are not necessarily a feature of the credit information industry, and that PCRs are not necessary to achieve competitive credit markets. In India, a number of entities exist that are related to providing credit information. They include four CICs, CRILC, CERSAI, other databases in the RBI and the Ministry of Corporate Affairs, and the upcoming IUs. Given the existence of all these entities, the RBI also needs to argue why the existing entities are not sufficient, and why yet another government agency needs to be set up. In the absence of such articulation, it is not clear that further state intervention in the form of PCRs is warranted. Shah, Ajay, Solving market failures through information interventions, Ajay Shah's blog, April 2015. Government of India, The Insolvency and Bankruptcy Code, 2016. Insolvency and Bankruptcy Board of India, Insolvency and Bankruptcy Board of India (Information Utilities) Regulations, 2017. Prasanth Regy is a researcher at the National Institute of Public Finance and Policy, New Delhi. The author would like to thank Anirudh Burman, Pratik Datta, and an anonymous referee, for helpful comments.